Dark past : A spring dawn in the picturesque granite hills of the Warby Ranges in north-eastern Victoria. I’d camped overnight beside a small dam up in the ranges, and after a quick breakfast I rolled up the swag, grabbed my binoculars and camera and meandered through the dry rocky outcrops above camp. Though early, the morning was already warm and the air dry—a sign that the day would again be as hot as it had been for the past week. A pair of Brown Treecreepers were busily working the gnarled limbs of the Blakely’s Red Gums that leaned over the gully, a Leaden Flycatcher had captured some tasty morsel and was devouring it on a small wattle branch, and in the distance I heard the unmistakable three-syllable laugh of an owlet-nightjar which so often peer from their roosting hollows at this hour to catch a few early morning rays of sunshine. Continuing on, I noticed a small party of Fuscous and Yellow-tufted Honeyeaters flitting about close to the ground, making the most of the remaining water in a tiny rock pool. I propped myself against a boulder to see what would come by. First on the scene was a Diamond Firetail which approached the pool in bursts of about half a dozen brisk hops, took a few long sips with its candy-red beak and furtively retreated back into the bush. Next in line was a male Hooded Robin. The most ‘colourful’ of the black and white birds of the Australian bush, its black plumage is so solidly black and its white feathers so purely white. Seldom do I see this species attracted to water as I suppose it gleans sufficient moisture from its insectivorous habits. Without any fuss the robin plunged into the pool and began to bathe feverishly in the shallow water, thrashing its wings about and flicking droplets of water around like a garden sprinkler. My camera shutter was working overtime, when I heard the whirring of wings close by and a bright flash of colour caught my peripheral vision. Alighting on a small branch just metres away, flaring its bright yellow tail feathers, stretching its vibrant blue wings and sporting a stunning scarlet shoulder patch, was an adult male Turquoise Parrot, one of the most spectacular yet unobtrusive inhabitants of the area. Underneath the woodland canopy, the dappled light revealed his full splendour; every colour and detail. Then, as I watched, he fluttered to the ground, clambered clumsily over some leafy debris to the waters’ edge and scooped up a few mouthfuls before lifting off, uttering a high-pitched zit-zit-zit as he went. Though this encounter was brief, it will produce vivid memories for a lifetime, made all the more magic by the fact that at one time Turquoise Parrots had been notably absent from these hills for at least fifty years. Although Turquoise Parrots can be a regular sight in some parts of the Warby Ranges, the nearby Chesney Vale hills and around Chiltern and Eldorado, they are generally quite rare and not always easy to find. In fact, throughout their range, which broadly extends on both sides of the Great Divide from central Victoria to southern Queensland they are sparsely distributed and occur only in pockets of suitable habitat in specific regions. However, in the 1930s, the species began re-establishing itself in many areas of New South Wales and southern Queensland, though it wasn’t until the 1950s that Turquoise Parrots started to reappear in Victoria. 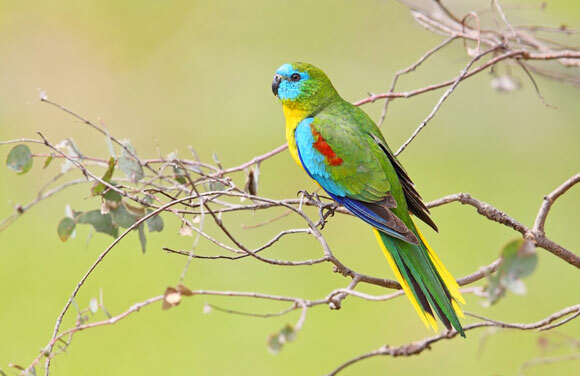 In 1966, Roy Wheeler reported a sighting from Taminick Gap in the Warby Ranges, and Len Robinson and Ed Whitbourn subsequently found several Turquoise Parrots nesting in low stumps—the first breeding records in Victoria for over 60 years. Local farmers Ray and Graham Colson were bemused by the sudden interest from birdwatchers, as they had been noticing small numbers of Turquoise Parrots on their property since 1954, unaware of the birds’ status as an endangered species. We can’t know for sure why the initial decline of the Turquoise Parrot was so sudden and widespread. While habitat clearance may well have played a part, this alone doesn’t account for why Turquoise Parrots declined more rapidly than other woodland birds. As a species belonging to a group generally known as ‘grass parrots’, Turquoise Parrots are characterised by their habit of feeding almost entirely on the ground on the seeds of a variety of native grasses, herbs and small shrubs. Therefore, the changes to ground-layer vegetation brought about by grazing of livestock and introduced rabbits was almost certainly responsible for their decline on a broad scale, and this impact would have been exacerbated by the widespread ‘Federation Drought’ that occurred across eastern Australia from 1895 to 1902. During this time, rabbit numbers increased to plague proportions, resulting in some farmers losing everything and walking away from their properties. Turquoise Parrots would also have been eaten out of house and home. Throw indiscriminate shooting, predation by foxes, the burgeoning feral cat population, and the possibility of disease into the equation and it is obvious the species was facing a number of threats. And though localised, trapping was so intensive in some areas such as western Sydney, that one old trapper noted that in the 1890s he would catch two or three dozen before breakfast! By 1910, the same trapper reported that the birds had completely disappeared. Whatever the reasons for their decline, it is certainly a relief that enough remnant populations of Turquoise Parrots held on through the tough times to allow for their recolonisation. The Turquoise Parrot’s penchant for hilly country, as described by Gould, could well have been its saving grace. Had it preferred a life-cycle centred on the grassy lowland plains, where pastoral practices commencing in the 1840s saw the transformation of diverse temperate woodlands into farming monocultures, the Turquoise Parrot quite possibly could have gone the way of the unfortunate Paradise Parrot, whose country in southern Queensland was similarly decimated. How to explain the resurgence of the Turquoise Parrot? The species has no doubt been a beneficiary of a reduction in rabbit numbers that occurred with the release of the myxomotosis virus and subsequent poisoning in the 1950s, and was later aided by the cessation of stock grazing in national parks and nature reserves in the range country of New South Wales and north-east Victoria, which included some key Turquoise Parrot country. Seeding grasses and small shrubs palatable to stock and rabbits would have become increasingly available, and Turquoise Parrots could once again rely on this important food source. Turquoise Parrots have also adapted to foraging on the introduced herbs and grasses that have gradually colonised woodland habitat throughout their range, especially in the more open areas and forest edges preferred by the species. When breeding, some weed seeds such as Quaking Grass and Cape Weed are crucial, as they are fed to nestlings and fledglings by adult birds. Post-breeding, in autumn and winter, I have observed communal foraging flocks of up to 70 birds feeding on weeds such as Heliotrope and Chickweed among the marginal pastures and sparsely treed paddocks abutting the timbered ranges. Turquoise Parrots may also have been favoured by the proliferation of available water sources. Several small dams were constructed in gullies throughout the Warby Ranges from the 1940s onwards as a source of water for stock and to fight bushfires, and numerous other dams have been established on privately-owned land in known Turquoise Parrot areas. A recent study on Turquoise Parrot nest-site selection found that proximity to water was the most significant habitat factor affecting nest-site location at the landscape scale and although there is often a natural presence of water throughout the ranges in the form of seasonal soaks and pools in rocky gullies, these often dry out by late-spring, so the presence of drinking water in dams could be crucial to Turquoise Parrots at a time when they most need that resource—the breeding season. During this time, male Turquoise Parrots need to drink regularly to ensure a moist consistency in the food they regurgitate to females and young at the nest. Underpinning the resurgence has also been a likely adaptation to nesting in a changed environment. Like other parrots, Turquoise Parrots use cavities in stumps and trees, though unlike most other species they show a distinct preference for slim, vertical or near-vertical hollows with an upward-facing entrance, rather than a side-facing entrance. This may be through necessity though, because of competition from other more aggressive hollow-dependent species, such as Eastern Rosellas, Red-rumped Parrots, Sugar Gliders and Brown Treecreepers for the better quality arboreal hollows. Nevertheless, contemporary research has shown that Turquoise Parrots use small cavity entrances in hollows that are low to the ground, and of the 13 nests that I observed over the past two breeding seasons in the Warby Ranges and Chesney Vale hills, all were in dead stumps, small broken-off trees or fence posts, with entrances ranging from one to five metres off the ground. But is nesting in low stumps a true reflection of the species’ preferences or simply an adaptation forced upon the birds as a result of past logging and clearing activities? History can provide some insights into how settlement and human activity may have affected the Turquoise Parrot’s nesting habits in the region. From the mid-1800s, Benjamin Warby took up the 9,000 hectare ‘Taminick Run’, which saw the introduction of sheep and cattle grazing in the Warby Ranges. Wood-cutters were engaged to ringbark and remove trees to promote grassy glades for the stock, undoubtedly removing large numbers of hollow-bearing trees. In the early 1900s, other landholders in the district felled trees to fire steam-generated power in the nearby town of Wangaratta. In the 1950s and 1960s, trees were still being ring-barked and cut from many parts of the Warby Ranges for fence posts and firewood. There were no chainsaws when most of these trees were felled, so they were cut with an axe wielded at waist height—leaving a preponderance of metre-high stumps left throughout the forests and woodlands. Following the exposure of heartwood, and the efforts of termites, many of these cut stumps developed vertical hollows that were used by Turquoise Parrots for nesting. This suggests an intriguing and perhaps counterintuitive scenario whereby past logging and clearing practices may have resulted in the increase of potential nesting sites throughout the parrots’ habitat in and around the Warby Ranges, possibly assisting the species’ comeback. The 1966 breeding record of Turquoise Parrots at Taminick Gap was indeed an example of a nest-site housed in a stump cut some 20 or so years earlier. But since logging ceased in 1979 when the Warby Ranges was proclaimed a State Park, the cutting of stumps rarely occurs and stump hollows, which appear to degrade more rapidly than elevated stem and branch hollows, are becoming scarce. As such, there may be a further decline in the number of available nest sites before hollow formation increases through tree growth and subsequent senescence. 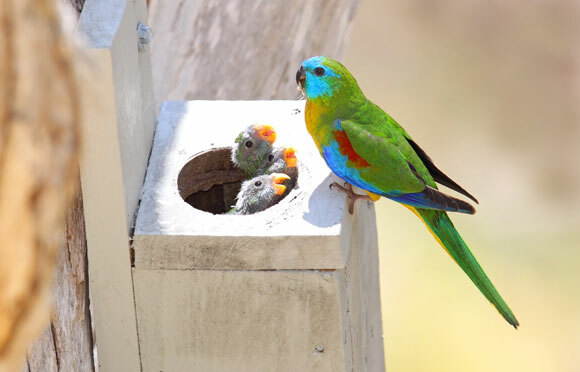 Turquoise Parrots may again experience reduced nesting opportunities which may become a major limiting factor for the population, unless stump hollows can be repaired and held-together, or artificial hollows be put into Turquoise Parrot breeding areas. With this worrying prospect in mind, two years ago I initiated a Turquoise Parrot recovery project through the Broken Boosey Conservation Management Network—a community partnership in the Broken River and Boosey Creek catchment with a focus on protecting, improving and learning about biodiversity. Funded by the Victorian Government, the project is aimed at local landholders in and around the Warby Ranges and the Chesney Vale Hills, with a specific emphasis on protecting and restoring breeding habitat and managing foraging habitat on privately-owned land. The inspiration behind the project was the work of Len Robinson. Impassioned by his experience with the birds in 1966, Len and his friend Trevor Owen spent decades experimenting with methods of providing more nest-sites for Turquoise Parrots by hollowing-out naturally occurring stumps with an auger and providing artificial nest hollows at various sites in the Warby Ranges. Several of these hollows were occupied by Turquoise Parrots and the initiative was deemed successful, but the last batch of hollows was placed in 1990 and it is unlikely that these would be intact and useable today. 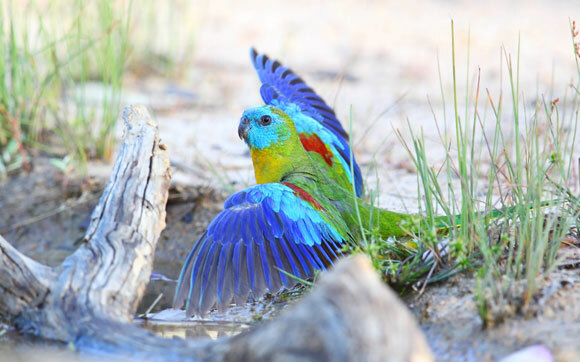 More recently, in 2010, artificial nest-hollows were again placed around the Warby Ranges by Monash University researchers who were investigating Turquoise Parrot nest-site requirements, and again the hollows were readily occupied. The current project builds on these previous efforts, and has so far seen the introduction of an additional 200 potential nest-sites, specifically designed to accommodate Turquoise Parrots. Nearly all of these have been placed at key breeding sites on private property. Graham Colson, who first noticed the birds on his property in the 1950s, still lives at Taminick Gap, and along with his daughter, Fiona, are actively involved in the current project. It was with great excitement that he contacted me last October with the news that Turquoise Parrots had taken up residence in one of our newly installed nest-boxes on his property, not to mention the two other active nests elsewhere on his place in hollow logs that he and Fiona had erected. Shortly after that, during one of my routine nest-box inspections on a neighbouring property, I was thrilled to find another female sitting on eggs in one of our nest-boxes. All of these nests resulted in the successful fledging of young birds—20 to be precise. Creating artificial nest-hollows may only be a partial and temporary solution, but the provision of prime-quality nesting sites is a simple, immediate and relatively cost-efficient measure that can help maintain the Turquoise Parrot population until such a time that natural tree and stump hollows become more readily available. Nest-box construction and installation on private land also provides important landholder engagement opportunities. To date, we have distributed nest-boxes and modified hollow logs rescued from bushfire clean-up operations to over 25 properties. These landholders receive regular information, attend community events such as walks, talks and nest-box building days, accompany me on woodland bird surveys, manage stock, restore habitat, control predators and check and maintain the nest-boxes on their land. The project has resulted in improved community awareness and understanding of the species, its requirements and its threats, which leads to improved habitat management and better conservation outcomes. Coordinator of the Conservation Management Network, Janice Mentiplay-Smith, has ensured that the Turquoise Parrot work ties in with regional, catchment-scale conservation priorities and the project has been given immense regional exposure and publicity, furthering the appreciation of wildlife amongst the community. It is a privilege to work on such a fascinating species. The Turquoise Parrot’s story is quite remarkable—a little bird that was almost lost but which bounced back against the odds. It is equally pleasing to work with a community and band of landholders who genuinely want to be involved in ensuring that this delightful species never disappears from our woodlands again. Bigg Boss 11: Shilpa Shinde or Hiten Tejwani, who do you think will walk out of the house this week?